This is Part 3 and the final in our series on data exploitation by firearms registries. Read Parts 1 and 2 here, but be sure to Opt Out of Australia’s myHealthRecord system today. Click here to Opt Out. An attendee of the recent Queensland Police Minister’s advisory group on firearms has spilled the beans on ammo limits. He explained that the first phase involves banning you from owning any cartridge for which you don’t own a firearm. That’s been confirmed by another attendee. If you borrow a friend’s rifle to hunt or target shoot and you don’t own a rifle in that calibre – you’ve got an inconvenience. 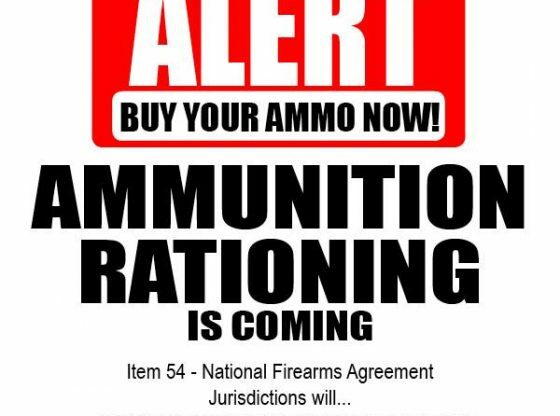 If your friend buys the ammo and you pay him back, you risk falling foul of the law for selling ammo without a license under the Explosives Act. Step at a time, this is the direction in which Queensland farmers and shooters are being increasingly victimised by policy based on fear (‘farmers are terrorists’) instead of data (crime by licensed is incredibly rare). How can that be enforced at the dealer’s counter? In a paper world, you might have to bring your weapons list or PTAs along to the dealer’s counter to prove that you own a firearm in the calibre you want to purchase. Dealers may soon be able to search you on Queensland’s online firearms register to confirm you own a firearm in that calibre. Read here about the proposal for Australia Post to host the new register. The Australia Post service would offer a great mechanism for Weapons Licensing to track and query your ammo purchases. Is the firearms registry safe at AusPost? AusPost has big ambitions. Until recently, AusPost was positioning itself as a provider of ‘Digital ID’ for Australians. Australia Post revealed that the information that may have been breached is extended in the case of successful applicants, and would have included personal information such as bank details, tax file number and superannuation details, diversity information, emergency contact information, conditions of offer and employment and other details. AUSTRALIA Post’s security operations have been hit by yet another security flaw – the third in four weeks. The names, addresses, businesses, email addresses, landline and mobile numbers of Australia Post recipients are being exposed by simply manipulating the website URL. Queensland Weapons Licensing are swift to insist that victims of safe burglaries are charged for failing to store firearms adequately. Will they be as swift to charge anyone responsible for improperly storing an entire firearms register? People reacted strongly to our previous post on myHealthRecord. Thousands of readers were deeply concerned that firearms registries would be accessing health records at scale and automatically running fitness assessments against people on that information. Some people couldn’t understand how that could happen, so we’re going to explain. First, you have to understand that the automated merger of massive datasets of individual records by government agencies and big business isn’t just possible, it’s old news. Take one of the grandest Australian examples, the ABS-run Multi-Agency Data Integration Project (MADIP). While MADIP may be a benign research-focused federal government effort that integrates all your welfare, tax, health and education records, it is a clear example of what has been happening for years. When the firearms registries have mass access to health (and other) records, they will naturally be using them to regress against risks. You need to understand this isn’t about causation (ie. whether you’ve done something wrong); it’s about correlation (whether you have factors similar to someone who has done something wrong). Action can be taken even if you’re doing everything right. Before you put in your license renewal or permit to acquire application, a mathematical regression process has determined your age, location, the firearms you own or some one of a thousand other factors correlate to you being high risk. The Registry insists you go and get a doctor’s report or produce a risk management plan or take some other costly steps before they’ll renew your license. All of these first steps can happen automatically, cheaply and without manual processing by a staff member. You can protest your innocence. If they don’t like you or aren’t happy with what you offer, then you get to fight them at your own expense in QCAT. If you don’t believe this will or can happen, then you haven’t been following Weapons Licensing’s War on Farmers. Queensland Labor doesn’t like farmers owning pistols. Hundreds of farmers have had their renewals refused, even when they’ve had their license for decades. Some of them are spending thousands to fight Weapons Licensing in QCAT. Click here to read about the the cattle farmer who won against Weapons Licensing. Weapons Licensing are appealing so he’s back in court spending money to defend his position. If this doesn’t illustrate the point, what does? 1. What does this ammo limit proposal achieve besides cost and inconvenience? 2. Why are Queensland Police looking at contracting Australia Post IT given its data security issues? 3. Will the Minister take personal responsibility for any failures from AusPost hosted registry? 4. Why are farmers like Mr Salmon being dragged through appeals that have little prospect of success?